Mubaraks Allegedly Pocketed Money From Ticket Sales for Travelling Exhibits: Are the Feds Going to Investigate Here? The report also indicates that Zahi Hawass (is he in or out?) has denied the allegations. One suspects this is just the tip of the iceberg. The other question that should be investigated is whether US archaeologists or institutions that helped facilitate these exhibits also helped facilitate such corrupt practices. US Government prosecutors have shown how aggressive they can be in breaking up alleged smuggling rings for Egyptian artifacts of limited cultural and artistic value. But, how aggressive are they when it comes to investigating corrupt practices that may have bilked US institutions and tax payers out of millions of dollars? Not very, apparently. As set forth below, Greek cultural bureaucrats and their allies in the archaeological community have lobbied for the inclusion of coins in the newly announced MOU with Greece. Yet, why should the US Government preclude American citizens from importing unprovenanced Greek coins when both the Greek National Coin Collection and the private Alpha Bank collection recently accessioned valuable Athenian Decadrachms that also lack a provenance? Has anyone in the State Department Bureau of Educational and Cultural Affairs told Hillary Clinton that imposing import restrictions will place burdens on Americans that the Greeks themselves won't put on their own citizens and institutions? 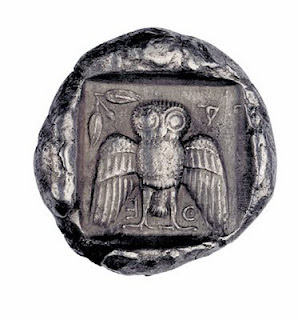 And it's not as if these coins likely came from Greek contexts. In fact, the scholarly literature puts the typical find spots of such coins further East in places like Turkey and Syria. Thus, the Greeks have little basis to claim they were merely buying back what had been "stolen" from them. Of course, all this was discussed during the CPAC hearing on the Greek MOU. But, did it sink in? The Greek cultural establishment and archaeologists will no doubt politicize this gift as a repatriation that helps argue for support for the recently announced Greek MOU. But, what are the odds that Greek authorities would have published the hoard, particularly given cuts to Greece's cultural establishment? And if the Greeks and archaeologists are so concerned about unprovenanced coins, why don't we hear more about the unprovenanced coins in Greek public and private collections, most notably valuable unprovenanced Athenian Decadrachms, recently added to the collections of both the Alpha Bank and Numismatic Collection in Athens? Scholarly publications place the find spots of virtually all of these coins as being outside of Greece. David Gill and Paul Barford, where are you? Buckingham Palace's Roof Needs Repairs: Kate's Wedding Dress to the Rescue! The British Government has made painful cuts to its budget (something the US has not yet had the stomach to do). The Brits still saved enough money to celebrate the wedding of the royal heir in considerable style, but money is hard to come by for necessary, but "unsexy" things like repairs to the palace roof. And no wonder. The articles point to the lack of transparency, the apparent overbreath of the coming restrictions and Greece's own abysmal record in protecting its own cultural patrimony. They might have also mentioned that approximately 70% of the public comment posted on the regulations.gov website either opposed the MOU in toto or the extension of import restrictions to coins. And what will American voters who collect ancient art and coins think about these new restrictions? The ever political Hillary Clinton should also consider that as well. The government maintained that they were stolen property because the issue was recalled to be melted before they were officially issued. Whether they were released by corrupt officials or not, I'm happy the coins were saved from the melting pot. It would be a real shame if for some ridiculous bureaucratic reason they will not escape that fate now. How about selling them to the highest bidder to help with our budget deficit? Every little bit helps. It now appears that Zahi Hawass may be back as Minister of Antiquities yet again. Mubarak first appointed him to the newly created post in the last days before his government fell due to street protests. Hawass then abruptly resigned after he became the target of demonstrations. He has maintained, however, that he did so to protest the lack of security at archaeological sites around the country as well as false claims over "stealing antiquities and doing other illegal things." Hawass was then reappointed after he promised unemployed archaeologists new jobs. However, the honeymoon did not last long; after more protests aimed at his administration of Egypt's antiquities bureaucracy, he was sacked again and replaced. But his replacement never took over the post so Zahi remains in control. Revolutions are often messy, but this has become a farce, or perhaps at least the makings of a movie script. But, if so, who will play the publicity loving Zahi Hawass? CPAC's new chair, Professor Patty Gerstenblith, has made the following statement in an interview to "DePaul Newsline Online." Unfortunately, perceptions about CPAC's worth as an advisory committee (as opposed to rubber stamp to be ignored when its recommendations don't mesh with State's apparent desire to impose the broadest restrictions possible) are quite low in the collector, dealer, musuem communities. Under the circumstances, I can only hope Prof. Gerstenblith can have some success in achieving her goal. This agreement that we are signing today will protect Greece’s culturally significant objects even further from looting and sale on the international market. It will be illegal to import protected items from Greece into the United States unless they have been certified by the Greek authorities. And that will help reduce the incentive to illegally remove such objects in the first place. Of course, if that was all the agreement did it would be far less objectionable than it is: But restrictions also bar import of items on the designated list from other legitimate markets abroad unless accompanied by documentation proving they were out of Greece as of the date of restrictions. The problem is that such documentation typically does not exist for common artifacts like ancient coins. Certainly, as far as I know no other country (including Greece) requires such documentation before importing ancient coins into the country. Is Secretary Clinton misinformed about the impact of import restrictions? And if so, who at the Bureau of Educational and Cultural Affairs is responsible? Expect a laundry list of Greek cultural property to be restricted to be announced shortly. I assume coins will be included despite the fact that approximately 70% of the public comment received by CPAC either opposed the MOU in its entirety or the extension of import restrictions to coins. I also wouldn't take the claim that the decision was consistent with the recommendations of the CPAC too literally; State made the same claim with respect to Cypriot restrictions despite CPAC's recommendations that coins not be included in the MOU. President Obama has claimed he is not anti-business, that his administration is for government transparency, and that he is against over regulation. Yet, his State Department's administration of the CPIA and its extension of import restrictions to common artifacts like coins (that are widely collected abroad including within Greece) strongly suggests otherwise. Where will he go? To the archaeology department of an elite University? To Hollywood? Wherever it is, I'm sure we have not heard the last of him. And what of the allegations of corruption? Will his departure end any inquiries or stimulate them? That too remains yet to be seen. Hawass: No Guilt By Association! Gill purports to be a serious scholar and the AIA deems his work worthy of an award. Based on such foolishness, however, one has to question whether either is the case. Will US and Egyptian Authorities Aggressively Investigate Alleged Corruption in the Egyptian Antiquities Ministry? We now know that the US Government will aggressively pursue those who allegedly smuggle ancient artifacts of Egyptian origin. But will the Egyptian Government be as aggressive in rooting out alleged corruption in Egypt's antiquities ministry? And will the US Government seriously investigate whether the millions in US taxpayer dollars invested on Egyptian archaeology was well spent or frittered away through fraud, waste and abuse? Lifeline for Zahi and Justification for "Emergency Import Restrictions"? Yet, many Egyptians will not forget the Mubarak ties or the charges of high handed conduct and corruption leveled against Hawass and his ministry. Yet, the activities complained about in the indictment against Mousa Khouli et al. date from 2009, not 2011. And, they do nothing to explain how private archaeological groups with professional and financial interests with Hawass and his ministry were able to gain some commitment from the US Government that such restrictions were a "done deal." You might not know it from the Immigration and Customs Enforcement ("ICE") publicity machine or the musings of archaeobloggers Gill and Barford, but the indictment in United States v. Khouli, et al., really comes down to the issue of whether the Defendants submitted proper paperwork to the Government when they imported Egyptian artifacts from Dubai, United Arab Emirates. The main issues relate to declarations of country of origin and value of the merchandise in question. But it remains to be seen whether the government is able to prove "scienter" or "guilty knowledge"as to either. There is confusion in the trade and even Customs itself as to what to put into the "country of origin" box when it comes to ancient art. In addition, values of ancient artifacts are based on the purchase price in an arms length transaction. Dealers buy low and sell high. And sometimes the government has been known to fib as to the value of the artifacts that are seized (in addition to claiming that they are priceless). Troublingly though, this does appear to be a major expansion of the government's war on collecting. This is usually the stuff of civil forfeiture actions, not criminal claims. Moreover, I'm not aware of collectors being subject to criminal charges in the past. For the ICE press release, see http://www.ice.gov/news/releases/1107/110714newyork.htm. Repatriationists within the State Department seem hell bent on returning the material to the Iraqis-- the only question is whether the State Department will spend the $3 million in US taxpayer dollars appropriated to restore it first. Under the circumstances, wouldn't it be better to turn over the material to the Jewish Iraqi community living abroad rather than to the Iraqi State that was responsible for persecuting Jews and eliminating Jewish culture in Iraq? The article also exposes business ties between National Geographic and Hawass. But don't these business ties suggest a potential conflict of interest that should be investigated before such import restrictions are considered at all, let alone considered a "done deal" as Hawass himself has suggested? "One hand washes another" has been long a staple of Egypt's corrupt political scene, but it should play no part in the State Department's decision making whether to clamp down on the import of Egyptian cultural goods by U.S. citizens. One suspects that given Italy's ongoing financial crisis (even worse than our own) there will be no more money any time soon to help fix the problem. And even if money were plentiful, one wonders whether the Italian bureaucracy would ever allow real reform. The Art Newspaper has certainly chronicled elsewhere bureaucratic resistance to any reforms at all. All this again underscores the utter foolishness of the State Department's recent extension of the MOU with Italy and its expansion to include certain coins. Archaeologists claim that import restrictions are necessary to encourage the preservation of archaeological sites and encourage research. But how is this possible if the Italian state mismanages even major sites like Pompeii so badly and there is no money to help conduct this research? Meanwhile, import restrictions make it far more difficult for American collectors and institutions to continue their own private efforts to study and preserve ancient artifacts and coinage. Thus, they have the perverse effect of actually working against the goals they supposedly were put in place to help foster. It's high time for the U.S. Government to conduct a real cost-benefit analysis of these MOU's. Is throwing a bone to cultural bureaucrats and archaeological fanatics really worth the cost to collectors, museums and the small businesses of the coin and antiquities trade? And do such restrictions advance or detract from the advancement of knowledge and the preservation of artifacts from the past? And finally, in this time of financial austerity should the U.S. taxpayer foot the bill for enforcing regulations against importing artifacts of "Italian type" when the inept and corrupt Italian cultural bureaucracy cannot even adequately take care of what it has? http://phdiva.blogspot.com/2011/07/arm-museum-guards-to-prevent-looting.html Most "looters" in places like Egypt, Iraq and Peru are "subsistence diggers" who remove treasures from the graves of their ancestors in order to put food on the table. Do we really want to encourage them being killed in the name of archaeology? As for the armed gangs of archaeological lore, to the extent they exist at all, wouldn't they likely be better armed than the guards? Of course, every country is free to address this issue in its own way, but I also suspect that Professor Rothfield wants Western countries to fund these armed guards. And let's not forget. Shoot the looter was the practice in Saddam's Iraq. Is this really who we want to emulate? The Cultural Property Advisory Committee (CPAC) is supposed to represent a diversity of opinion, but President Obama's appointments to date only represent one view-- that of archaeologists who want to clamp down on the trade in cultural artifacts. President Obama has protested he is not anti-business, but so far the White House has appointed no one to CPAC who represents the interests of those who actually have to deal with import restrictions on a daily basis. Instead, only academic critics of the trade in cultural artifacts have been appointed. How about appointing some members of the trade (for whom three slots should be reserved under the CPIA)? Or, why not appoint some collectors to the three public slots or museum professionals to the two slots reserved for museum interests? Shouldn't consumers of artifacts subject to restrictions also be represented? This is not a partisan issue. There are plenty of Obama supporters who collect ancient artifacts, but they may very well be less likely to vote for his reelection if his administration continues its present course of ensuring that an "archaeology over all" perspective dominates CPAC. Dorothy King has taken on a quite ambitious project-- creating a database of known looted material accessible to the public. One really wonders why such a project has not been undertaken by source countries like Italy or members of the archaeological community. They certainly have much easier access to such information as well as the resources to make it happen. But, presumably that might ruin the game of "gotcha" these groups and their associated bloggers like to play against collectors and auction houses. Good luck to Dorothy on this daunting task.